Outspoken Bishop Reuben Kisembo has on more than one occasion called on President Museveni to retire. Bishop Reuben Kisembo of the Rwenzori Anglican Diocese has insisted his weekend public statement calling on President Museveni to retire peacefully was not abusive and was made in good faith. 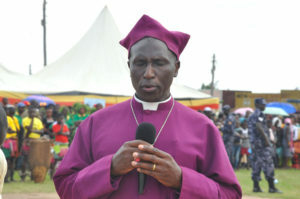 In a follow-up statement published on his Facebook page yesterday (Sunday), Bishop Kisembo, who insists he doesn’t belong to any political party said: “Was that statement disrespectful, abusive or confrontational? As for the venue and forum, I was just fulfilling my religious role of sharing God’ word in season and out of season (2Timothy 4:1-5)”. President Museveni who was presiding over the official opening of the new Kyebambe Girls School chapel on Saturday did not take the call for him to retire kindly, responding to the remarks by the Bishop as an undisciplined way of engaging on issues. Bishop Kisembo had asked the President to disregard last year’s acrimonious constitutional ammendment and retire. I rarely respond to different posts especially connected to my sermons or public statements. This time round I thought I should respond to posts by different people basing on my remarks at the opening of St. Elizabeth COU Chapel at Kyebambe Girls’ SSS where the President of Uganda was the Guest of Honour. First and foremost I thank the President and all people who have given us money, ideas, skills, time, energy and materials which have enabled us to build this magnificent Chapel to worship in our Triune God. May our good Lord reward you all abundantly. Was that statement disrespectful, abusive or confrontational? As for the venue and forum, I was just fulfilling my religious role of sharing God’ word in season and out of season (2Timothy 4:1-5). I have categorically stated that I don’t belong to any political party whatsoever and don’t promote anybody’ interests. I don’t have an atom of interest in any political office. I am just fulfilling my calling as a religious leader who has the mandate to talk about anything created by God whom I serve. + Reuben Kisembo, via Facebook.